Please refer to our stock # 10495 when inquiring. This is a sodenashi ( vest ) of sori-hiki ( sledge-hauling ) from Shonai region in Yamagata prefecture in Tohoku district. It has rectangular pieces of cloth with sashiko ( quilting ) attached in one of the shoulders and in front diagonally for strength and ornament. 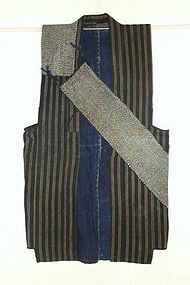 It is made of hand-woven cotton stripe and it has hand-spun and natural indigo dyed cotton for the lining. In excellent condition. 50.5cm x 81cm Late 19th to early 20th century.